Beautiful watch and great quality that you would expect from the Fossil brand! I bought this for my teenage daughter and she absolutely loves it! 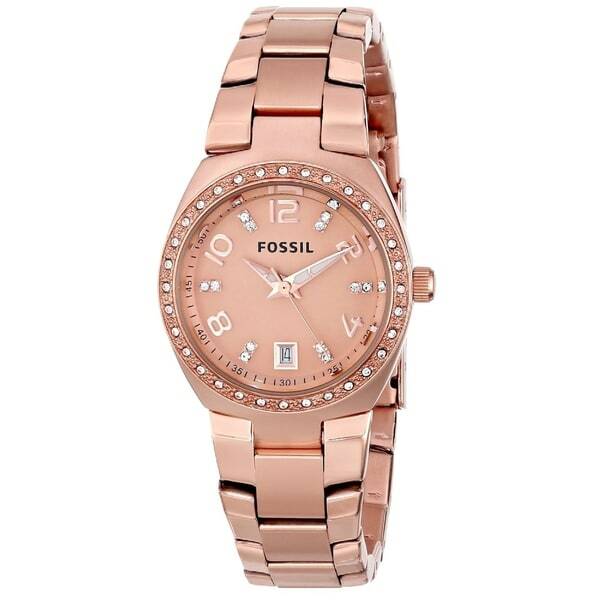 A stainless steel bracelet and case adorned with crystals make this Fossil watch an instant classic. A rose goldtone dial, precise quartz movement and a water-resistance level of up to 100 meters finish this fine timepiece and lend it a modern beauty. I just received my beatiful new watch and I absolutely love it! It is far more beautiful than I thought it would be,especially with all the lovely bright crystals! They really look like diamonds! The rose gold color looks really good with my tanned skin! I am already getting lots of compliments! Love this watch, good quality, nice finish. I love this watch. It looks great and was exactly what I was looking for. This is a very nice watch if you want one that is small and delicate. I was looking for a larger one. Item arrived quickly and was just as described. I was upset that I had to purchase a new battery for it. I wouldn’t have minded paying a little extra to avoid the inconvenience. needs to have some type of adjustment, a little to tight! For my mother for Mothers Day. I hope she loves it. Christmas gift for my wife from our son, she has a 6 year old fossil watch and have had no issues with it.